SO you want to visit Russia… how hard can it be? Maybe the most difficult and time consuming visa process you will encounter in the Northern Hemisphere, but it’s totally worth it… here’s your guide to visiting Russia for the first time. Cyrillic – Don’t expect to come to Russia and see signs offering an English translation – it’s perhaps even offensive to expect this would be the case. 99.9% of signs will be in Cyrillic, so it’s a good idea to learn the basics such as ‘exit’ ‘entrance’ and ‘restrooms’. Traffic Jams – Particularly in Moscow but also in St Petersburg, tourists should expect traffic jams and lots of them. When in Moscow, avoid being on the roads during peak hour as it is not only timely but also considerably more dangerous to be in traffic during these times. Russian Rubles – The currency of Russia is the Ruble. You can exchange money once you are here, but remember US dollars and Euros are preferable. Weather – Russia is renowned for its’ harsh climates. If you’re visiting in winter, don’t expect to be able to do everything you have planned – it can be crazy cold! The weather is also very temperamental so be sure to pack some warmer items even for Spring or Autumn. Food – You will find many options beyond Russian traditional food so rest assured, there will be something for even the fussiest eater. Tourists will pay more – It is common for locals to charge tourists more – from cab fares to sales on the street. You should expect this and accept it as part of your trip to avoid having an argument with a local. Safety – As with anywhere else in the world, safety should always be of concern. That doesn’t mean you have to wear a tourist purse around your neck but if you are worried, why not? Go with your gut feeling. Ahhh, the ominous Russian Visa. As a brief introduction, know that there are 6 types of Russian visas. If you are visiting for less than 30 days, you will be concerned with the tourist visa. The tourist visa is the best option in terms of price, processing speed and flexibility. For first time visitors, it’s important not to miss both Moscow and St Petersburg. Many first timers will also include the trans-Siberian railway. Moscow – First time visitors should not miss a visit to the Russian capital. The Red Square, St Basil’s Cathedral, the Kremlin…. there really is so much to see here in Moscow and these highlights just scratch the surface. If you’re a history buff, you won’t pass up the offer to have an insight into Russian history by visiting the capital. 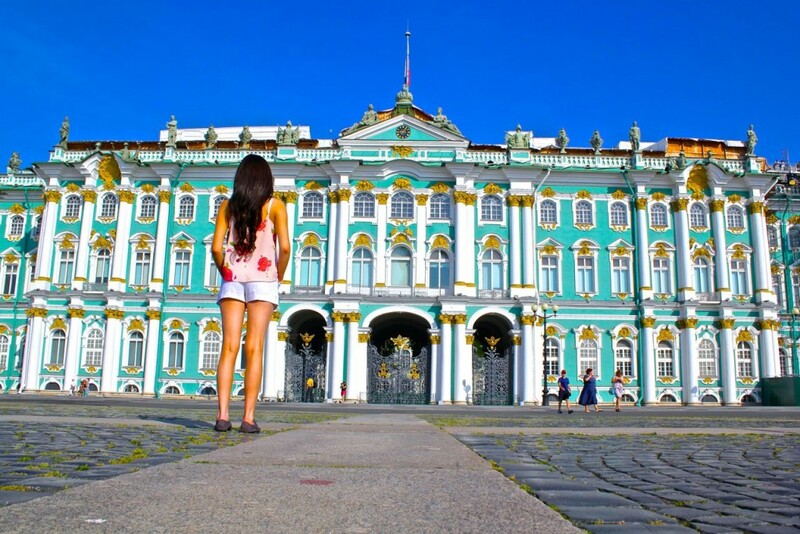 St Petersburg – Often regarded as the more touristy city to visit in Russia (which it is), St Petersburg is a true gem that should certainly be visited on your first visit to Russia. It will feel as though you have stepped inside a time warp with the most incredible architecture, sunny summers, and fantastic palaces to visit. These are some really very helpful tips for someone visiting Russia for the first time. Especially, the language and safety tips should help for sure. I think Russia is a great country to visit and have some unforgettable experiences. I wish to visit Russia the next year. Here are the top 10 tourist attractions in Russia in my opinion. I wish to cover these all. And I am sure these tips are going to help me a lot. Good guide! Why not I want to visit Russia-Moscow! I wouldn’t advise people to wear any kind of special ‘tourist’ safety items – it’s super safe, even in Moscow. Also, because of recent changes in the Embassy rules (can’t go to the embassy and have to pay a fee to the office you go to), it’s easier to pay a company to get your visa. This is so helpful!! I’m planning on going to Russia for the first time next year, and the thought of organising a visa and learning Cyrillic is absolutely overwhelming…! Your “ominous” Russian visa made me laugh 🙂 being a Russian I have to get these “ominous” visas to more than 50% of the countries that I visit. UK and the US are the worst, and cost a small fortune. I think the one for the States will set me back more than $300 when I renew it. sighs. as I’m from St. Petersburg I just wanna add that the best time to visit St. Petersburg is definitely mid-may – mid-july since this is the time of white nights and not only it is beautiful and unusual for people from more southern places, but also the energy and the drive is amazing and people are not really sleeping. But first half of may and mid-july – end of august are good also. First part of september maybe be warm and sunny but not always. If you visit at any other time, you may by disappointed but constantly grey sky, lots of rain and not to mention cold! St. Petersburg and Moscow are beautiful places. Two years ago I was in St.Petersburg, stayed in the W St.Petersburg, which was a perfect stay.